2016 is a year of big birthdays and 9 January marked the 75th birthday of Joan Baez, who began her career singing at the celebrated Club 47 in Harvard Yard and went on to take Newport 1959 by storm, writes Liz Thomson. By the close of 1962, she’d been on the cover of Time Magazine and was playing a key role in introducing Bob Dylan, ‘the unwashed phenomenon’ as she sang in ‘Diamonds and Rust’, to public attention. More than half a century on, she is still touring and making records and her influence can be heard in the work of innumerable singer-songwriters – and even in a couple of unlikely HM acts! In 1995, I was privileged to report for Mojo on two of the four sessions at the Bottom Line in New York’s Greenwich Village – concerts captured on the album Ring Them Bells. It was a ‘bringing it all back home moment’ for Baez, as she played with old friends and new, among them Janis Ian, Mary Black and Mary Chapin Carpenter, as well as her sister, Mimi Fariña, who died too young in 2001. By that time, I’d met her on several occasions, orchestrating a press call at Greenham Common in 1984 and interviewing her a couple of times, but this was different – a ringside seat at events that would prove a turning point in her long career. I was privileged to sit in on a rehearsal and watch Joan and Janis lark around, watch Baez and Black sing together for the very first time. How quickly – how magnificently – it all came together. We chatted in a suite at the Fitzpatrick Manhattan the day after the second show. In December 2000, I was invited by Britain’s Open University – where Dr Alberto Baez, the singer’s father, had been the first professor of physics – to give a lecture on Joan Baez as social activist to the Sixties Research Group, of which I was then a visiting fellow. 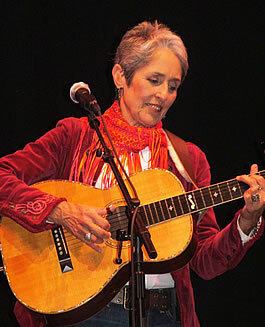 Mary Wharton’s 2009 American Masters documentary, How Sweet the Sound, tells the story of Joan Baez’ remarkable career.